Made specifically for select Canon built-in lenses, the durable unit converts the focal distance of your lens by a factor of 0.75x when attached to the camera, making it ideal for group shots or panoramic nature photos. The unit which requires the LAH-DC20 lens adapter is compatible with the following Canon models: S5 IS, S3 IS, and S2 IS. -Converts the focal length of the body lens by a factor of approximately 0.75 (35 mm film equivalent at maximum wide angle: approximately 27 mm) when attached. 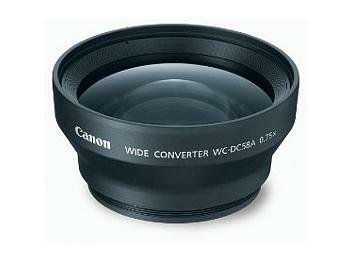 -This lens requires Conversion Lens Adapter LAH-DC20.